I'm very keen on animals, like you are, I'm sure. Especially giant, lumbering, prehistoric mammals, although beasties of all sizes and genera win my heart. Mastodons are much associated with the La Brea Tar Pits, which are just east of the fictional Wilfair Hotel. I wanted the friends of the Wilfair world to have sort of an "animal spirit" they could reference and occasionally imitate, a creature that was a bit mystical and mythical and a little shaggy and a little tusked and a little -- make that a lot -- hard to find nowadays. The mastodon won out and won my heart. When Fair Finley makes awkward hand claws in the books, and summons her mastodon "rrowr," I usually have to pause my typing and make claws and a fierce face, too. You can guess that is totally attractive and not at all strange. When I grow up I'd like to be a pliosaurus. This comment seemed appropriate for this post. Ohhh, the beautiful water dinosaurs. I'm a fan, too. I hope you do become one when you grow up and then I can say I know a real pliosaurus. I thought of you yesterday, Erika. I drove to the Valley on an errand and to eat one of my favorite breakfast burritos. Maybe one day we can have one together! Mmm. I think perfectly cooked potatoes make the breakfast burrito for me. You? Fair's mastodon move is ver endearing. I also have a clawing, Thriller-inspired move that I break out at odd times. 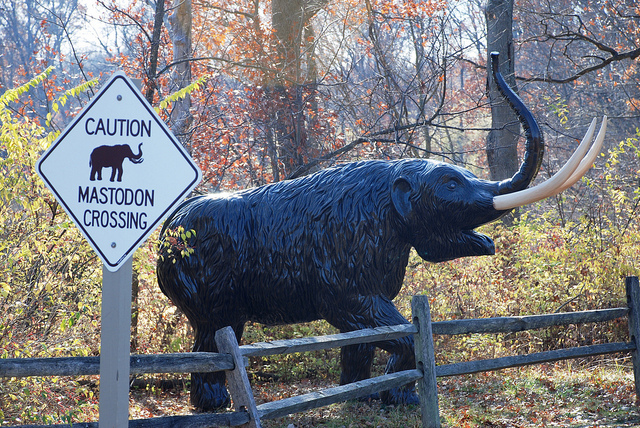 Mastodon v. mammoth? An excellent question. I found some good links that I'll include in a future post. I want to say they lived at slightly different times and the mammoth was slightly larger. So here's my "Thriller" story: My dance teacher Kim Blank was one of the zombies in the video. Right!?! So each Halloween she teaches the moves. It is quite hard and so fun -- especially the "claws up sideways walk" part -- and it also happens to all go down in The Wilfair's neighborhood. Yet another little magical odd factoid of the area. If you ever happen to be in LA over Halloween, you are SO taking that class with me, little zombie. Now I want some sort of "Thriller" dance in the books, too. I am in agreement on the potatoes but one can never underestimate the importance of a delicious salsa. If the salsa is bad it ruins the whole experience. A dance teacher from "Thriller"?! Too much fun. A Halloween Thriller lesson sounds thrilling and hopefully better than a disastrous encounter I had with as hip hop dance class in college. Erika: Agree on salsa. Do you have a favorite brand? I like El Pinto. My issue is the salsa has to be sun-hot. It usually means I'm crying while enjoying my breakfast burrito, but they're tears of joy. Total spicy fan. Also? I will enjoy knowing you when you are a pliosaurus one day, because I am sad to say I am not acquainted with any at the moment. Also? This might be the first conversation ever involving the breakfast burrito and the pliosaurus. Bess: I like dance class stories, the good and the uncoordinated. Mine generally fall in the latter group. If I am buying it I like Santa Barbara salsa but it's not always super spicy. I am with you though! Bring on the tears of joyous pain! I will try it and report back! I think I've seen it at my store. I can skip the spicy if the flavor is there. Thanks for the rec.